The best, period: VAC's S54 7.25" clutch kit- a tremendous piece of engineering: The best flywheel and clutch kit money can buy, bar Nothing. Used in infamous 1000+ WHP turbo M3's, Custom Supercharged builds, full on race wining touring cars and other exotic projects where the ultimate performance without sacrificed is demanded. Linear pedal effort similar to a OEM clutch with a more positive engagement... Gear changes so smooth it feels like a new transmission; unbelievable. Tiltons Carbon-carbon friction pack has all the best characteristics a clutch can have; the smoothness of organic with strength and power holding that can easily exceed sintered iron. An excellent choice for any super high performance build. Linear engagement characteristics similar to a street clutch with extreme heat capacity of the carbon matrix plates enable this clutch to be easily modulated/slipped without overheating and failing as others can. This characteristic also helps to reduce stress placed on other driveline components. The combination of the Carbon/Carbon clutch's extremely low inertia and the lightweight billet flywheel produces amazingly improved acceleration and very smooth high-rpm shifting as the syncros can match speed in the transmission much faster. The Tilton Carbon/Carbon clutch assembly also includes two additional pressure plates that compensate for wear, extending the life of the clutch before a rebuild is needed. Our VAC adapter kit allows the standard BMW master cylinder to operate Tiltons Hydraulic release bearing directly; offering low effort and perfectly linear engagement. There is no longer any clutch fork being used, eliminating this weakness and potential failure point. 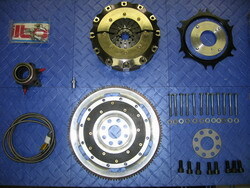 Used in 400-1000hp M3's, gear change is so smooth it feels similar to a street clutch. Engagement so positive its like a puck clutch ... unbelievable.